The weekend edition of the Wall Street Journal features Dingel's Oven Salted Caramel Shortbreads! Look for it in the "OFF DUTY" section of the paper and online. Thank you editors at the WSJ! with a back coated with salted caramel. A few months ago we were introduced to Dingel’s Oven, located in Beaverton, Oregon. What a find! And what a solution to gift-giving throughout the year. Because anyone who receives a box of cookies from Dingel’s Oven will look forward to another one, and another, and another. Bakers Uta and Ego specialize in the most delicious shortbread cookies and gingerbread cookies. Both are made in three-inch square “tiles” with crimped edges and a large monogram in the center. The cookies themselves are perfection, made even more perfect because each batch is hand-baked to order. In a cookie tin (provided by you), they’ll last for more than two months. That would be a theory, because no mere mortal can resist devouring them. But in the name of research, we’ve kept a few for almost three months now. While not as perfect as the fresh-baked—for example, the terrific fresh butter flavor we initially tasted is now a normal butter flavor—they are still delicious. No one who hadn’t tasted the originals would know the difference. The cookies freeze well, too. 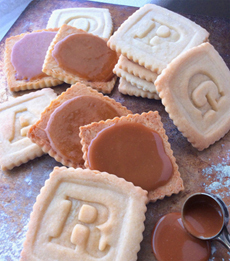 The shortbread tiles have a surprise: The bottom of each cookie is covered with salted caramel. Shortbread and salted caramel together is wedded bliss. Requests for the gingerbread tiles continue beyond the holiday season, so the cookies are available year round. Centuries ago, ginger was expensive and a holiday splurge; that’s why gingerbread is associated with Christmas. Today, there’s no reason not to enjoy it year-round—especially with memorable cookies like these. Many companies say that they only use the freshest, simplest, purest ingredients of the highest quality. That may be so; but Dingel’s Oven ingredients are even fresher and higher in quality. The butter in the shortbread really sets the bar, as does the ginger in the gingerbread. The cookies are sold by the dozen. One dozen 3″ x 3″ cookies are $24. The recipes contain no peanuts or nut products. No artificial additives, preservatives or extenders are used whatsoever. Sorry, but there is no gluten-free option. Your personal message will be written on a gift card. For corporate gifts, the card can feature a 4-color logo. But don’t tarry. Since every the cookies are hand-baked to order, the bakers need two-week lead time for the holidays; and as much lead time as possible is greatly appreciated. Thank you, Dingel’s Oven, for creating a memorable cookie that solves just about all gift-giving needs. 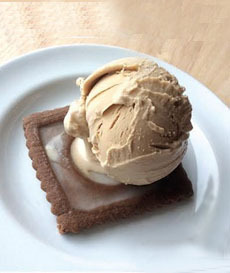 Serve the cookies à la mode, with vanilla, coffee or rum raisin ice cream. Photo courtesy Dingel’s Oven. accompany each order – right on top of the box. Simply email us your logo as a jpg file or your personal message.